If you need to have your Ontario driver’s license renewed, replaced, reinstated or you just need to update your personal information, you might not know how to do it or what options are available to you. The good news is that whether you want to renew or replace your driver’s license in Toronto or a smaller town, the process is the exact same. We outline the various scenarios you can encounter below to help figure out what you need to do. When It Expired Less Than 1 Year Ago (or Will Soon Expire)? First, when your license is due for renewal you will receive a notification in the mail around 90 days before the expiration date. If you need to take a driver’s license test or provide any additional documentation during your renewal letter will have additional instructions to follow. 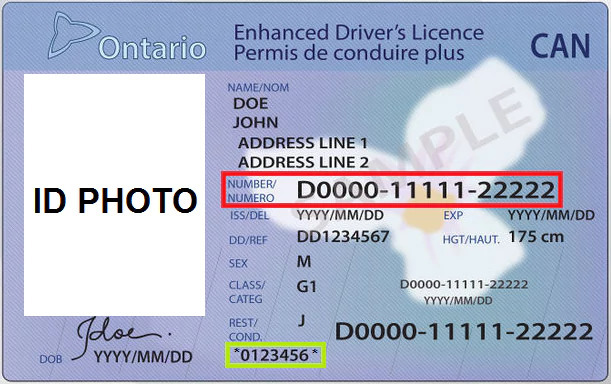 To renew your license online you will need your Driver’s License number (red box below), the 7-digit Trillium number (green box), postal code, and a valid credit card to pay the renewal fee. If you want to find the nearest ServiceOntario Centre you can use their Locations Finder. Useful Tip! The 7-digit Trillium number contains no dashes or letters and is surrounded by an asterisk on either side. It will either be on the front of the license card (at the bottom and under the Restriction field) or on the back of the card above the scanner strip. If your license expired more than a year ago then you cannot renew it online, and you must visit a DriveTest Centre or the ServiceOntario location in Toronto at College Park. You must bring an original ID with your legal name, date of birth and signature. The cost to renew is the standard $81.50 renewal fee plus the cost to complete any required tests. You can find a list of all the DriveTest Centre locations here. When my G1 or G2 License Expired? For more information, you can consult our guide on Ontario’s Graduated License Program. When I’m More than 80 Years Old? You might also be asked to pass a driving test or follow up with your doctor if there are any new medical concerns. These will depend on the results of your mandatory tests and screening exercises. If you need to also complete these further requirements you will be notified through the mail or have a counsellor speak with you at the Renewal Session. Useful Tip! You can find more details on what is involved in these Renewal Sessions here, including information about the eye exam, screening exercises, and group education session. If you are going to be outside of Ontario when your license would normally expire, you can renew it up to 180 days before the expiry date. There are two different ways to renew your license in this scenario, depending on how long your license will have been expired by the time you return to Ontario. If you will be returning to Ontario more than 6 months after your license’s expiration date, you will have to call Service Ontario at 416-235-2999. They will run you through alternative options in regards to renewing your license. Did You Know? If you moved out of the province, or just stopped driving at all, but your Ontario driver’s license will still be valid then you might be eligible for a partial refund of your license fee. You can find out more here. When My License Was Stolen or Lost? If you lost your driver’s license or it was stolen, you can get it replaced for a replacement fee. You will have to visit a ServiceOntario location with an ID that has your legal name, date of birth, and signature. They will issue you with a temporary paper driver’s license until you receive your new license card in the mail, which usually takes between 4 and 6 weeks. If you are outside of Ontario when it was lost or stolen you will have to go through a different process. If you will return to the province within 6 months you can contact ServiceOntario and arrange to have a temporary paper license mailed to you. Once you return to Ontario you will have to visit a ServiceOntario location to have a new license issued. If you will return to the province later than 6 months you will have to pay, through mail, for a new full license card to be mailed to you. When I Need to Update My Personal Information? If you want to change any condition or restriction on your licenses, such as the need to wear corrective lenses or glasses, you will have to visit a DriveTest Centre and pass any required test. For any change of information, you will need to present your current driver’s license along with any supporting documentation necessary for the specific change. When My License Was Suspended? If your license was suspended and you want to have it reinstated, there are three steps you need to complete: pay all fines that you still owe, complete all court processes and programs to have the suspension cleared, and then collect all necessary legal documents that prove the suspension was cleared. If your license was not suspended for non-medical reasons, you will have to pay a fee as well. Regardless of the reason, you will have to pay any fees for tests you must complete. Did You Know? You can submit your request for the reinstatement fee using the Ministry of Transport’s online application form here. There are many different types of scenarios where you would have to renew, replace, or reinstate your Ontario driver’s license, with a different process for each depending on your exact situation. This guide will hopefully help you figure out what you have to do or at least point you in the right direction. If you have any questions not answered in the guide you can contact a ServiceOntario Centre. Good luck!